Today, we have two free foil template designs to give to you, to help you create a magical look on your crafts in minutes! Read on to find out how to make this gorgeous home décor piece to hang proudly during the festive holidays. 1. 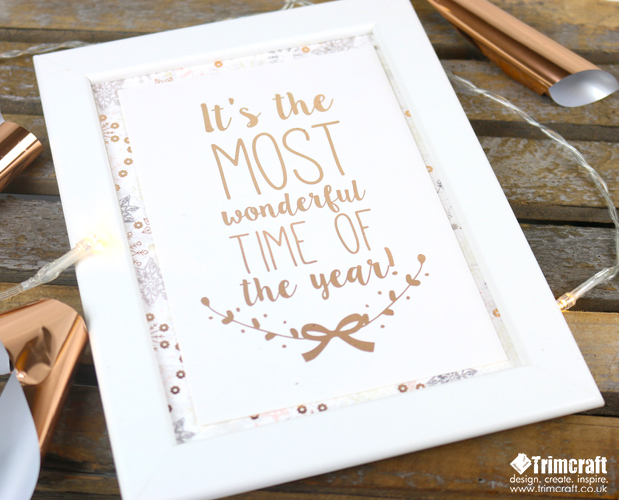 With your laser printer, print the ‘It’s the most wonderful time of the year’ design in black onto a sheet of First Edition Ultra Smoot A4 card. Make sure the printer is set to the maximum ink coverage setting. TIP: You can resize the design for different purposes. You could make this printable smaller to use to make a Christmas tag! 2. Cut your card in half so you’re only foiling this sentiment design. 3.Cut a section of copper First Edition foil to cover the design. Layer the foil on top of your design and then cover with a piece of plain white A4 paper so you cannot see any foil. TIP: Ensure that when placing your foil down, that the colour side is facing up. 4. Switch on your First Edition Foil Applicator and wait until the green light is on. Carefully pass the design through the machine. 5. Once the paper has passed through to the other side of the machine, remove the A4 paper and slowly peel the foil back to reveal your foil design. TIP: Save the peel off sheet as you can use this for other festive crafting projects. 6. Pick a foiled design within your First Edition Christmas Promise 8x8 paper pad and cut it down to fit the size of your Dovecraft 5x7 card blank. Stick it down to the centre of your card with glue. 7. Cut down your foil design and adhere it to the centre of your card with Dovecraft Perma Fix Tape. 8. If you decide to use the foil template as a card design, you’re ready to send your lovely craft! If you’d like to turn it into a home décor piece, carefully place it inside your chosen frame. This sparkling gift will really make a wonderful keepsake to bring out each year! With the other foil design, we have used the traditional First Edition Christmas Story papers and red foil to make the card even more festive! The effects in the First Edition pads really complement the foil designs.